The Chinook is an American heavy-lift helicopter with a battle proven track record . The Chinook provides strategically important heavy lift capability to Indian Air Force ( IAF ) .The Chinook can be effectively used for rapid deployment of troops artillery guns, heavy military equipment and all types of heavy vehicles. The Indian air force urgently needed to replace its ageing MI-26 helicopters. After due process of technical evaluation and field trials, the American Chinook was awarded this contract for 15 Chinook ( Chinook CH-47F ) and Indian Air Force has received the delivery of first four of these Chinook in February 2019 . The first batch of four Chinook would be officially inducted in Indian Air Force on 25th March 2019. Till recently, the Indian Air Force was using Russian MI-26 for all heavy lift logistics operations. The MI-26 is the largest heavy-lift helicopter in the world with the capacity to lift 20 tons , which is almost double the capacity than that of US-made Chinook. Out of the last three surviving MI-26 helicopters, only one is currently operational because other two MI-26 have been retired in 2013. And therefore, the Indian Airforce Force urgently needed to find a suitable replacement for these MI-26 choppers because all the three leftover MI-26 have now grounded. The Indian Ministry of Defence invited RFP ( Request For Proposal ) for 22 combat helicopters and 15 heavy-lift helicopters in the year 2009. This acquisition chopper deal was worth the US $3 billion. The Chinese aggressive posture along the India-China border is a matter of serious concern to the Indian government . After India China war in 1962 in which India was caught off guard and consequently ,India lost this war . China, on the other hand, has consistently improved the infrastructure all along the India-China border whereas the successive Indian governments had neglected the infrastructure development along the Indian side of the border with China. The lack of infrastructure on Indian side along India-China border can be a major advantage for the Chinese army in the event of any potential conflict and the Chinese army would be in a position to quickly mobilize their army units and equipment. The Chinese side of the border in Tibet is relatively a flat terrain which will allow China to quickly deploy its armed forces along the border with India. Whereas, the Indian Side of the border is a completely a mountainous hilly undulating terrain which is a logistical nightmare for the Indian army. And therefore, it is important for India to quickly develop a robust heavy-lift capability which allows quick deployment of Indian armed forces along the Chinese border. And this is where the Chinook is going to make a big difference. The Indian army even today is heavily dependent on heavy-lift helicopters due to lack of infrastructure along the Indian side of the border .The Indian air force first acquired the Soviet era MI-26 which was the first Heavy Lift helicopters inducted in Indian Air Force in 1986. The Indian Airforce heavy-lift capability was dependent upon these MI- 26 Russian built heavy lift helicopters. However, most of the MI-26 are no longer operational and have now been grounded because the service life span of these helicopters is already over. The fear of Chinese reaction and lack of interest kept the successive Congress government away from building border infrastructure. India seriously started border road construction along China border only after Modi government came to power in 2014. The deliberate and repeated Chinese incursions into the Indian territory is a matter of serious challenge for the Indian government. The complete neglect of border infrastructure during the Congress rule in India has created a major gap in the infrastructure developed between the Chinese and Indian side. In response to Indian global RFP ( Request For Proposal ) For heavy lift helicopter and a combat attack helicopter, The Indian government received proposals from five companies which had expressed their interest in this tender. These five companies include Russia’s Kamov and Mil Moscow Helicopter Plant , European Agusta Westland and the Eurocopter . The American companies Bell Helicopter and Boeing also participated for this contract . The American company Boeing submitted its initial bid in October 2009 offering the Apache AH-64D Block-III Longbow attack helicopter which was later on , re-designated as AH-64E and the CH-47F Chinook heavy-lift , twin-rotor helicopters. After extensive technical evaluation and field trials conducted by IAF , the Indian government declared the American AH-6Apache as the winner for 22 attack helicopters against Russian Mi-28N . In heavy lift category , American Boeing Chinook CH-47F had emerged as the “L-1 ( lowest bidder )” as against Russian Mi-26 . The Indian government awarded both these contracts on 28 September 2015 and placed the order by signing the contract . Under this contract , the first helicopter ( both AH-64E And CH-47F ) is expected to be delivered to India in early 2019. As per the media reports , both these contract are on schedule. Accordingly, the Boeing has already successfully conducted the first field trials for both these helicopters in July 2018. 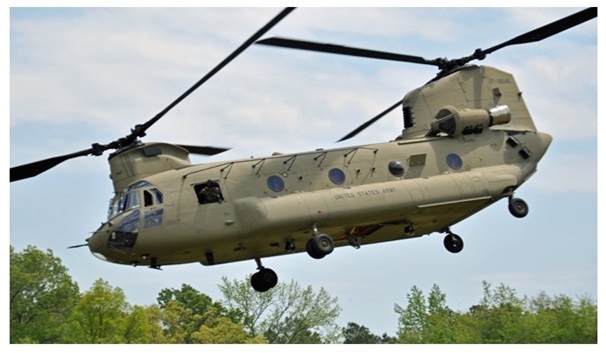 The head of Boeing India operations, Mr Pratyush Kumar, reported on July 27, 2018, that the first CH-47F Chinook helicopter designed for Indian Air Force has also successfully made its maiden flight in Arizona, USA. As on date March 2019, India has already received the delivery of the first batch of four Chinook CH-47 F and these will be officially inducted into the Indian Air Force on 25th March 2019. The CH-47F is a heavy lift advanced multi-mission helicopter currently in service for the US Army and several other countries . It contains a fully integrated, digital cockpit management system, Common Aviation Architecture Cockpit and advanced cargo-handling capabilities that complement the aircraft’s mission performance and handling characteristics. The Boeing CH-47F Chinook is an American version in the heavy lift category with twin-engine, with unique two tandem rotary helicopter designed by American rotorcraft company Vertol and manufactured by Boeing Vertol ( later known as Boeing Rotorcraft Systems ). The CH-47 is among the heaviest lifting Western helicopters. The Chinook heavy-lift helicopter provides several means of loading different types of cargoes . The Chinook has multiple doors across the fuselage to facilitate loading cargo inside the chopper. A wide loading ramp located at the rear of the fuselage which provides means to load heavy vehicles and equipments inside the fuselage . The Chinook provides total of three external ventral cargo hooks to carry underslung loads as well. Amongst the contemporary heavy lift helicopters, the Chinook is considered to be the fastest capable of a top speed of 170 knots ( 315 kmph) . The Chinook is available in different variants depending upon the mission requirements. The Indian contingent of pilots , maintenance engineers, technicians have already gone through extensive training at various Boeing training facilities in the US. Mission: Transport of troops, artillery, ammunition, fuel, supplies, water in support of combat operations, and civil and humanitarian relief operation. Service Customer: U.S. Army, in service since 1962. The Indian Army is still heavily dependent on the Indian Air force heavy lift helicopters for logistics support to operate along India China border . However, the current NDA BJP government has made substantial progress in building the necessary infrastructure along the India-China border after 2014 under the dynamic leadership of Mr Nitin Gadkari Central Minister for Road Transport And Highways. The Modi government has initiated a major road construction project under which total of 44 strategically important roads are being constructed along China border at the cost of Rs. 25000 Crores . The Indian air force heavy-lift capability is extremely important till the time the infrastructure along India China border is substantially improved by the Indian government. The Chinook will be a part of the Indian Air Force on 25th March 2019. 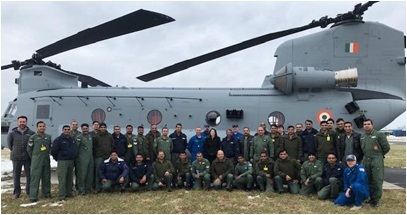 The Chinook will provide the Indian Air Force strategically important all-terrain operation capability to rapidly deploy troops, heavy equipment, artillery guns and transport vehicles. With the induction of Chinook, the Indian Air Force’s heavy-lift capability would substantially improve in years to come.